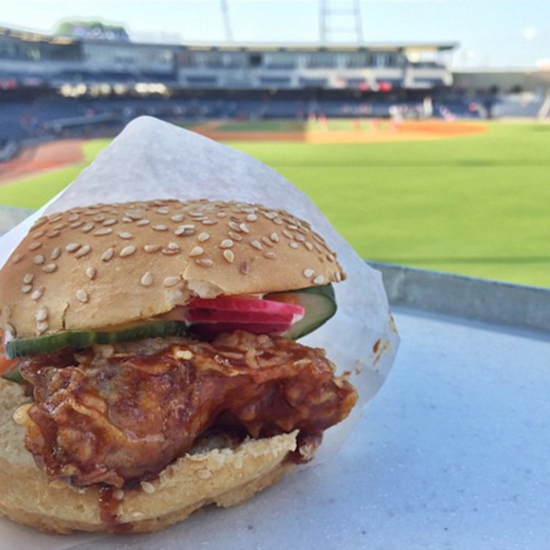 What, you’re not expecting to find an incredible Korean fried chicken sandwich at a minor league baseball park? Well, adjust your expectations. But amidst a truly impressive food lineup, its true standout is the Korean Fried Chicken Sandwich. “It’s Korean chicken, but in a Southern way,” says chef Jason Brumm — with a sorghum-Tabasco glaze, house-made pickles and a buttermilk dill dressing. The bread: It’s served on a sesame seed bun from a local Nashville bakery. The filling: Let’s start with the chicken — the batter’s liquid is 80 percent vodka and 20 percent water, which doesn’t get you buzzed but, according to Brumm, “inhibits the protein in the flour from developing which provides a crust that’s crispy like glass.” On goes the buttermilk-dill dressing, like a lighter, yogurt-based version of traditional ranch. Says Brumm, “The sweet, sour and salty elements, similar to Asian food, bring everything together— the crispiness of the fried chicken, the coolness of the dressing and a bit of spice from the pickles.” A home run if we’ve ever seen one.